Cat owners of Dewitt: need some tips for getting rid of the odor? Every cat lover encounters this problem sooner or later: your cat decides to mark a corner of your couch or carpet, and even though you’ve cleaned up the stain, the odor won’t go away. Cat urine contains proteins that create a strong, distinctive smell. 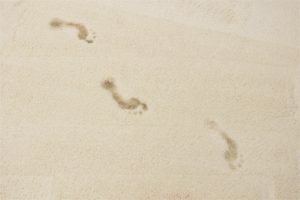 As such, the odor takes some special treatment to get rid of completely. Here are some steps you can take to get that cat smell out of your couch. The faster you clean a new stain, the less chance it will become a problem in the long term. Blot at the stain with a white cloth or paper towel as soon as you see it. 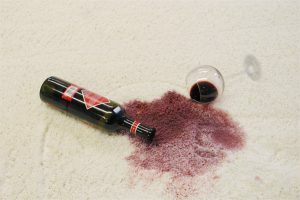 Do not rub the stain, as that will spread the stain over a larger area and work the urine into the fibers. 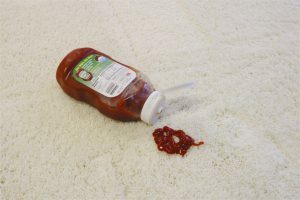 If you removed the stain a while ago, or if the stain faded over time, you may have difficulty locating the exact spot. However, because of the chemicals in pet urine, old stains will show up under a black light. Turn all your lights off and shine the black light over the area where you think the pet stain may be. The stained area will glow. Mark the spot with a sticky note or by outlining the stain with chalk. An enzyme spray contains ingredients specially-designed for treating pet urine. Specifically, the uric acid present in cat urine is hard to remove without an enzymatic cleaner. Apply according to the instructions on the bottle, and give it time to work. Home remedies will never completely remove the odor from cat urine, but they can provide a stop-gap measure before you head to the store. Because cat urine and ammonia share a similar odor, avoid using ammonia-based products. Instead, treat the area with a mixture of 1 part white vinegar to 3 parts water. Apply enough to the area to cover the stain, then blot with a towel. Some stains are just plain stubborn. For odors that won’t go away, contact a professional for cleaning help. Modernistic technicians have the tools and experience needed to remove any stain from your furniture, and can even help prevent staining and pet accidents in the future. Contact us today to schedule an appointment.